The production process of Wajimanuri | Japanese Traditional Craft "Wajima Lacquerware"
There are 124 stages in the wajimanuri production process. Here, we provide a simplified explanation on the process. The base shape is created with the wooden base. Once the rough shape is created, it is smoked and then it is dried and rests for around one year under the normal temperature. The outer surface turns blackish (as seen on the picture), and the white inside appears when scraped. By completely removing the moisture in the wood, it prevents deformation and cracks, and increases durability. Four key processes are involved in shaping the wajimanuri. The wood turner known as "Rokuro" is used to scrape the interior and exterior of the base with a sharp blade. 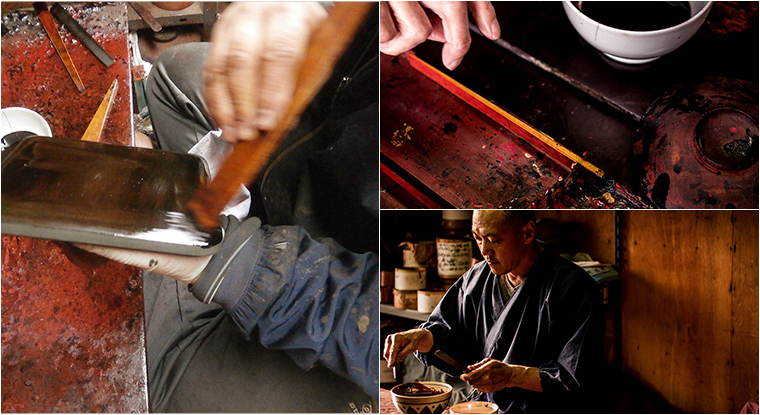 The blade used in this process is called "Kanna" and it is like a stick with the sharp blade at the edge. The wood is thinly grounded and is bent and formed into the desired shape. This skill is used to make oval shaped items such as Japanese lunch boxes. The wooden pieces are bonded using "Kokuso Urushi" which is a combination of lacquer and the grinded powder from Keyaki (zelkova trees). This is used to make furniture, Jyubako (Family sized bento boxes), and special trays for meals. Lastly, the wooden base shape is formed by "houkiji", the process whereby the wooden base is hollowed and carved out. This is a very detail oriented technique requiring concentration. At Wajima, the craftsmen specialised in this wooden base production process have their own studio. The base coat is invisible to the final product. However, it plays an extremely important role in enhancing the durability of the wajimanuri. It can be described as the unsung hero that is the least appreciated, but most valuable. First, raw lacquer is pored onto the wooden base to prevent the wood from absorbing moisture. 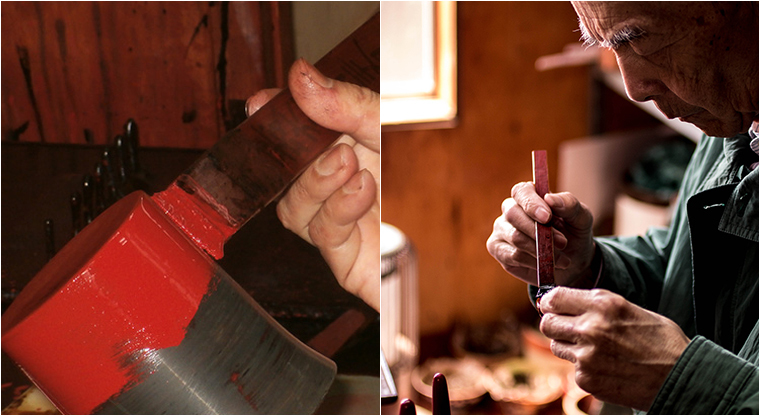 "Kosoku Urushi" used in the wooden base making process, is used again to enhance durability and intensity. This process is called "Kiji Katame", literally meaning to harden the wooden surface. After "Kiji Katame" is the transformational coating process. The delicate ends of the wooden base are coated with a special material made up of a mix of raw lacquer and rice glue. This process is called "Nuno Gise". Next is the "Soumiji Tsuke" process which is the smoothing of the surface after the base is dried. The entire surface is then polished using a grinding stone. 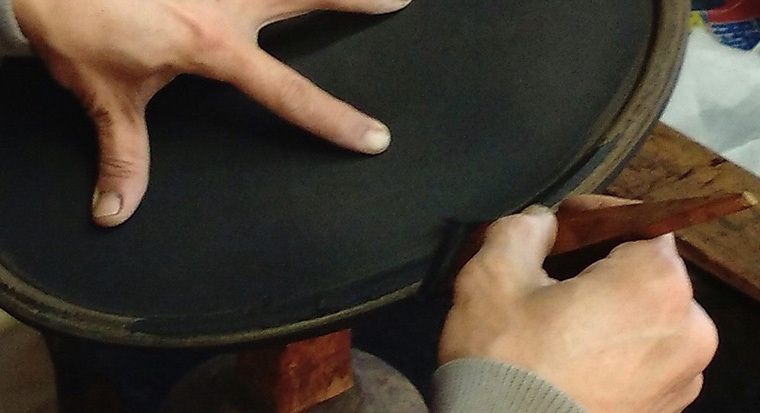 The next process is "Jizuke", which requires three layers of lacquer and three layers of scraping. For the first "Ippen Jizuke", grinded powder made of raw lacquer and rice glue are painted in several layers, and a rough grinding stone is used to lightly scrape the surface to make the next layer of lacquer blend well. "Nihen Jizuke" which is the next process, means using water and grinding stone to sharpen the surface of where the raw lacquer and rice glue were placed. The grinding powder used for "Nihen Jizuke" is more concentrated than the first "Jizuke" process. Lastly, "Sanpen Jizuke" is the same as the previous two processes but using smaller powder particles. The difference of the toughness in texture between the three "Jizuke" layers are hard to tell with the naked eye or by touching the surface. 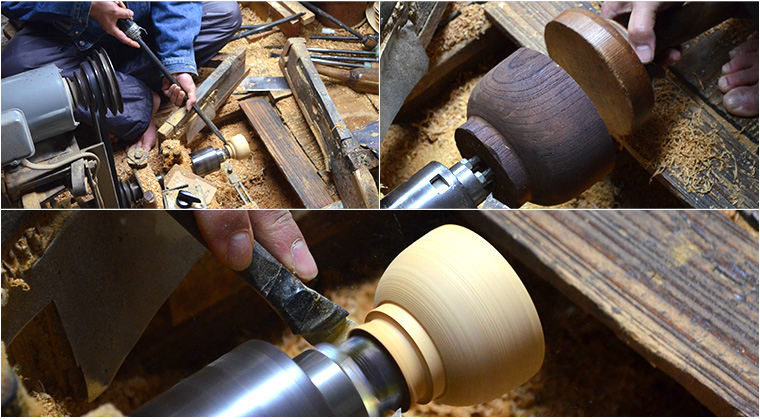 Since the finishing touches of the base coat layer can affect the final shape of the product, the Rokuro (wood turner) can be used to perfect the shape. Internal coating is the painting of purer lacker in preparation for the final coating. Here, lacquer that is purer than the one used for the base coat is used. Then, the item is dried in the "Nushi Buro", a special storage room composed of Japanese cedar trees to dry wajimanuri. 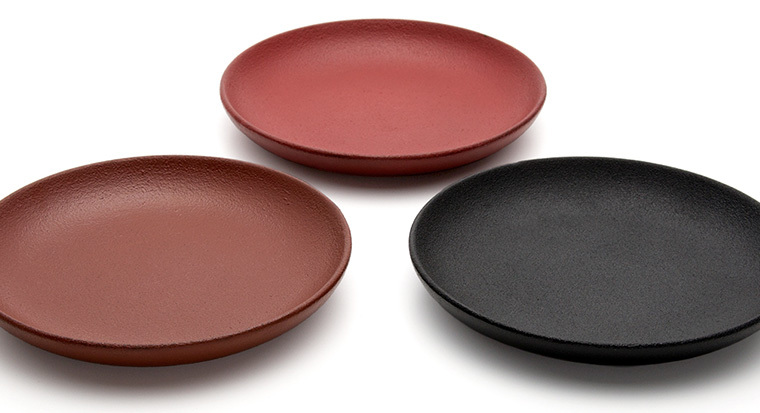 It is more about hardening the lacquerware through the moisture removal process, rather than drying up of the water. Therefore, managing the humidity and temperature is extremely crucial. The "Nushi Buro" helps to create strong lacquer. After internal coating, the dust is removed using the "Kanna", and the grinding stone and water are used to smoothen the internal coating. This process is repeated once and finally, it is cleaned with a cloth. In the top coating process, the best filtered lacquer is used to paint the surface. The thickness of the paint requires accuracy and a wide range of brushes are used. Extra caution is paid to avoid getting in contact with dust, and therefore, top coating is conducted in a separate room. When drying, the product is turned around from time to time to maintain the thickness of the lacquer in all directions. The wajimanuri is complete and some go in to the decoration process. Decorations for wajimanuri are categorised into three different techniques. "Roiro" which uses charcoal fire and uses raw lacquer to enhance the glossiness and colour. "Makie" which uses paint brush to decorate the surface with lacquer and placing gold and silver powder to create a piece of art. "Chin Kin" which uses a carving technique to create a piece of art to pour lacquer and then gold and silver powder on top. The "Makie" technique can use sea shells to enhance the colour and luster of the lacquer. The biggest difference of "Makie" is the detailed size of the gold powder particles in comparison the "Chin Kin". This additional detail helps to create a three dimensional effect in the art. The brush used in "Makie" comes from boat mouse fur, and this is surprisingly becoming rare and expensive. There is a variety of gold used for "Chin Kin". Gold leaf or gold powder may be used, depending on the product. Gold leaf is more chip-proof so it is used in the carved spaces, whilst the details are left for gold powder. Red and grey powder can also be used. At Taya Shikkiten, we offer unique non-gold "Chin Kin" products. Diatom earth is the key role for Wajima lacquer crafts. Craftsmen daub the mixture of lacquer and diatom earth only from Wajima onto foundation three times. The process gives heat retention effect and high durability to Wajima lacquer crafts. The diatom earth is called Ji-No-Kona in Wajima area. Also, the founding by Ji-No-Kona is called Hon-Koji. 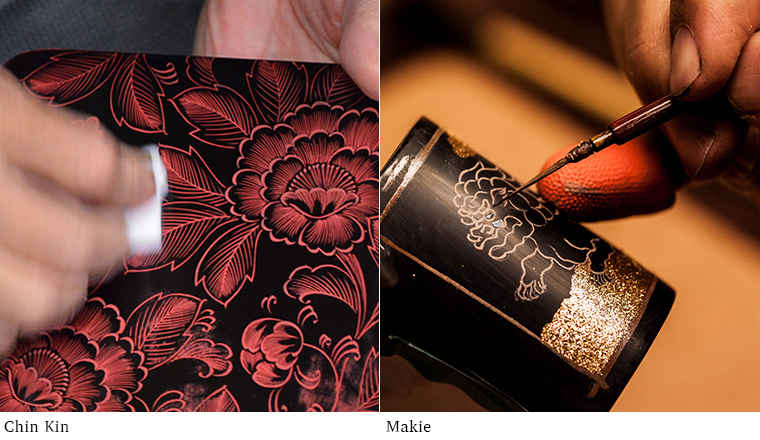 Makiji is one of the process of crafting Wajima lacquer crafts, sprinkling Ji-No-Kona over surface to add texture. Wajima lacquer crafts with Makiji process have texture on the surface so that they are durable for scratch by metal spoons and folks. 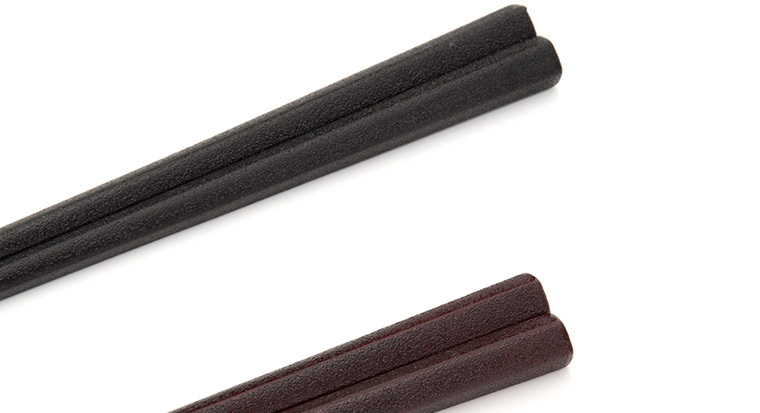 Of course, Ji-No-Kona is stick firmly by lacquer sealer. Wajima lacquer crafts with Makiji is very suitable as daily-use dishes. Kanshitsu is one of the processing methods of wajima lacquer craft. This process adds texture on the surface, preventing being bruised. Unlike Makiji, which is one of the other processing methods of wajima lacquer craft, Kanshitsu uses lacquer to make lacquer crafts textured. Through Kanshitsu, craftsmen firstly dry lacquer, and crush it into powder. Then, it is sprinkled on the surface of lacquer craft. It is hard to say the difference between Makiji and Kanshitsu, but the surface of wajima lacquer crafts by Kanshitsu process is smoother than those by Makiji process. Copyright(C) 2016 Taya-shikki All Rights Reserved.